Papa Lemon Books was launched after the owners left their corporate careers. Cousins Lehman Riley and Paul Dixon are proof that building a book business can be a lengthy lift. Give them credit for passion and perseverance, and a two-year push launched this year that is showing signs of bumping sales and hopes. In 2004, the Minneapolis natives launched Papa Lemon Books (papalemonedu. com) after Riley lost his staff job at Thrivent Financial following a merger. Riley, a 1981 Minneapolis North High grad, and Dixon, valedictorian of his 1982 class at Minneapolis South, traversed the court-ordered desegregation of Minneapolis Public Schools in the 1970s that brought out the best and worst in us. They had long been inspired by their late grandfather Walter ?Lemon? Cain. He was a black farmer and railroad worker in rural Mississippi. ?Papa Lemon,? as he was known, championed civility as well as civil rights and was a respected elder among blacks and whites in a segregated community. He died in 1973 at age 77. Riley, 54, who can recall the sting of discrimination since his school days, has written and advocated for multicultural understanding and civility that starts with children as the key to a better society and economy. He?s right. Dixon, 52, the son of a single mom who worked at a nursing home, turned down a football scholarship at North Dakota State University to accept an academic scholarship to the University of Minnesota. He graduated in business. Dixon spent his career as a buyer, including children?s books, for Target, and in toy licensing-marketing at the Walt Disney Co. He resigned from Disney last year to work full time on the Papa Lemon business. The pair published Riley?s first book in 2004, a story about a group of multiethnic pals known as the Little Wanderers. The young characters search for a historic figure to write about for a school assignment. They encounter neighborhood elder Papa Lemon. He shows them a magical, restored locomotive out back. They set a time dial to 1963, and head to Washington, D.C. They meet the Rev. Martin Luther King on the day of his nation-changing ?I Have a Dream? speech. ?Our goal always has been to get kids excited about reading, to get to know who they are, where they come from and listen to the stories of others,? Dixon said. ?We all struggle. It is awareness and understanding that bring us together.? ?The Adventures of Papa Lemon?s Little Wanderers,? the original book and the first of seven illustrated books for grade-schoolers written by Riley, is the most popular, with more than 8,000 copies sold. That?s significant, but no get-rich bestseller. The seventh and most recent book is about President Abraham Lincoln and addresses mental health problems. The business has been less than a commercial success, the owners concede. Sales in the best year fell well short of $100,000 before expenses, from book sales and Riley?s storytelling and talks to hundreds of schools and other groups over the years. ?It?s been tough at times,? said Riley, expressing gratitude for his wife, who works at a St. Paul hospital, and his now-grown children. ?It?s not been like when I had the corporate job with benefits. My wife encouraged me. Then again, she would say: ?It?s been five years, 10 years ???? he said with a sigh. Riley supplemented Papa Lemon earnings by working at a hardware store. 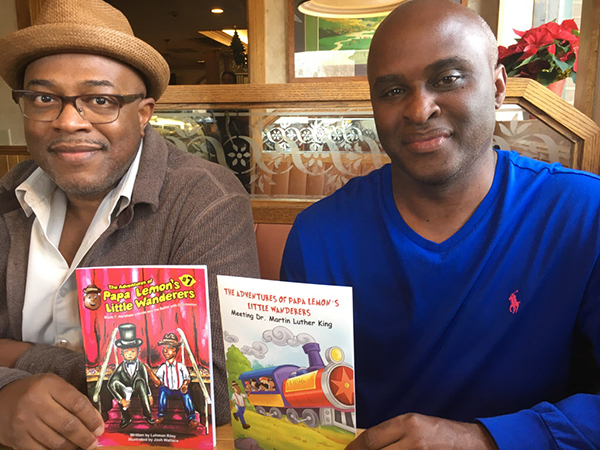 Papa Lemon books have been hailed as fun, informative and empathetic educational and life tools for young people by educators, children?s publishers and several local elected officials. A year ago, Dixon, who has yet to take a salary from Papa Lemon, quit his Disney job and moved to an apartment outside Los Angeles. He has contacts from his corporate career in the entertainment industry. ?The goal is to get the Papa Lemon books to where we are selling significant quantities, and based on those sales, sign a licensing agreement for the product with a large entertainment company, perhaps for a cartoon that animates Papa Lemon as a cartoon series. There have been hardly any cartoons that depict an African-American male character. ?I?ve also talked to potential investors. I?m optimistic. I gave myself two years and we?re just about to start the second year.? One radio interview that Dixon scored for Riley led to Papa Lemon?s biggest single-day online sales. Dixon is living on savings from his business career and a bit of consulting income. He learned frugality from his mother, who raised Dixon and his sister without frills. Dixon can remember her leaving their southside apartment every morning at 6 to take two buses to work. He also considers himself fortunate for having loving uncles and other male mentors. Dixon, divorced and the father of a U graduate, said he saved something from every paycheck he earned since his first job out of college. He and his former wife had their son?s tuition saved by the time he entered college. The couple also invested in a duplex near their Richfield home. It netted a six-figure profit when they sold it. Thrift and charity were also virtues of the admirable Papa Lemon. ?We lived modestly and below our means,? Dixon recalled. ?I always drove used cars. ?We didn?t have a car growing up. But I got to go to the Children?s Theatre. I?ll never forget that. I made enough in my corporate career for a good life. And to invest in Papa Lemon. ?